This is the step I’ve yet to see in the current retail market, and mostly characteristic of antique pieces. As you can see below, the labor is extensive, and requires strong hands, arms, and patience. The industry standard is hemp twine, the same material used for rope, and is incredibly strong when tied into layers. In fact, every old chair/sofa I’ve opened up or seen, 99% of them still have their hand tied springs intact. We’re talkin’ at least 50 years old! 8-way hand tied springs, along with horse hair used in genuine antiques, are the most enduring features of custom upholstery. Okay: 2-way method on ZigZag Springs. Good: 4-way method on Coil Springs. Best: 8-way method on Coil Springs. The magic of webbing is it’s ability to curve with angles, as well as create flat surfaces. It’s application involves coordinating a webbing stretcher to pull the webbing tight, then stapling in two directions for ultimate security. High end, mass manufactured furniture tends to utilize webbing as the seat instead of using the costlier hand tied coil springs. Weaving the webbing creates extra tension and strength. Back view of a love seat. Also made of jute like it’s buddy Webbing, burlap adds a finer touch to the foundation. It provides a solid base that all later materials will rest on. It is hand sewn using thick nylon thread, and a stitch that both flexes with pressure and remains stationary to the spring or webbing underneath. 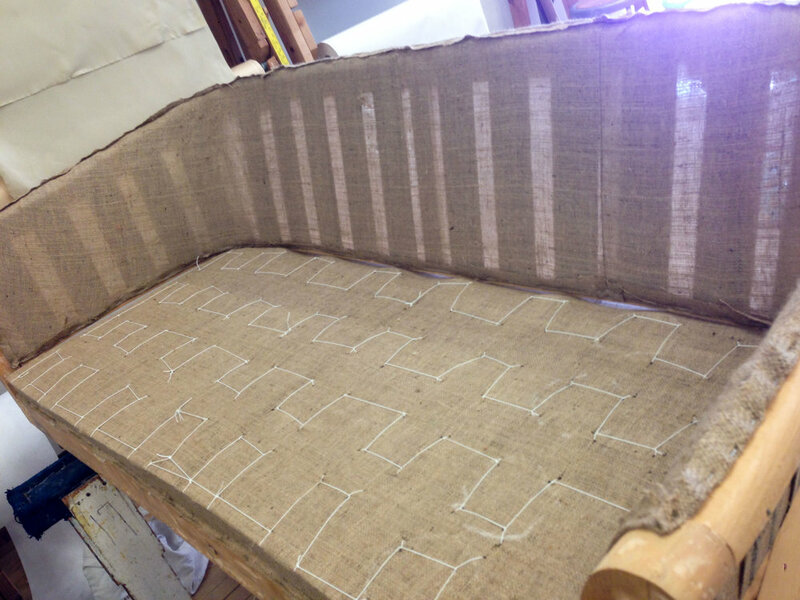 Burlap, like all other steps in the upholstery process, is stapled and hand sewn to the frame. THIS picture is burlap sewn to Coil Springs. Up to this point, all the other materials are available at most any upholstery supplier. Coconut coir is hard to find although it was used back in the day, antiques pre mid-century. I hand sew it to all the preceding layers, adding more strength and shape, and ultimately a solid base to support body weight and impact. Commonly used in quilts and blankets, unbleached cotton is sandwiched between the foundation and cotton muslin that will eventually contain it all. It creates a softer line by hiding the rugged foundation; it makes everything look smooth and pretty. It’s kinda like botox filling in the wrinkles so you appear more smooth…. After it is contained by muslin, it is beat with a rawhide mallet to flatten bumps and create a uniform surface. That last part is not like botox. Coconut Coir evens out the difference between the coil springs (under the burlap, burlap sewn to zig zag springs). Another layer of coconut to evens out the coconut framed out underneath. Cotton Muslin about to control that wild cotton batting. Simple cotton muslin is unbleached and has the strength to compress the previous Cotton Batting. If cotton batting is botox, then muslin functions like one’s skin. Unlike the face stiffening effect of botox, the combo of cotton and muslin make for a cushy n’ padded surface. This step is also helpful if you plan to reupholster your furniture every 3-5 years, needing only to replace the outer fabric rather than totally restoring the foundation every time. More layers are added in anticipation of the final outer fabric. You can still think of it as botox for upholstery. This stage is definitely exciting since we really start to see the piece’s personality emerge. Once I cover the frame, I move onto constructing cushions and pillows which means time spent on the sewing and overlock machine. When determining the shape of the seat cushions, I prefer a paper pattern so that everything is exactly symmetrical. It’s how garment construction is approached and my upholstery teacher never understood the extra work. I also make cotton muslin liners for every cushion and cozy pillow, and invisible zippers make it all look streamline. Shaping the perfect curve on the left arm. Match that bad boy on the right side. Mister Bird's placement is sooo on purpose. Now that you know how awesome green upholstery is, holla atta sista to get your own project started, call or text me at (213) 618-2143!